Hardwood, Hand-Crafted Designer Mantles are available in paint or stain grade poplar, oak, cherry or pine. Plain, fluted and reeded half columns or full round columns can be added to the pilasters. Click here for a Mantle Order Form. 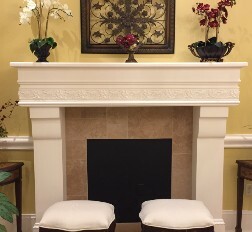 We also manufacture Custom Designed Mantles! Email us or call to discuss what you have in mind . . . we will even help you with the design if need be! Your fireplace is a focal point in your home. These beautiful mantles add class, charm and warmth that will reflect your discriminating taste. Most of the mantles shown are patterned after the traditional, authentic, "Old Masters" mantles, enhanced with subtle ornamentation and brought up to date to grace any home. All are handcrafted to the most exacting specifications. The natural grain and texture of poplar hardwood allows for staining or painting to match the other woodwork or the room decor. All of the styles illustrated can be made to custom sizes or in other hardwoods by special order. Submit drawings with accurate sizes for quotation and delivery information. Please call us for further information.